I have kind of a love-hate relationship with the Internet. It has become a necessary tool for writing and interacting with readers and other authors, but I’m often distressed by the way people use the power of the Internet to be mean and nasty to others. This week, I was reminded of the good that comes from this invisible thing linking so many of us. 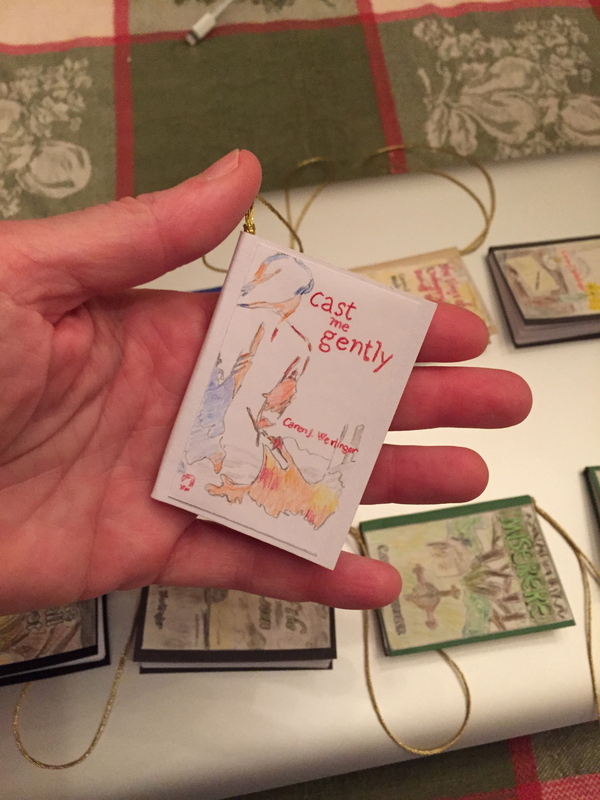 Earlier this week, I received a gift that brought tears to my eyes when I opened it – miniature hand-drawn reproductions of each of my novels with first and last lines written in each. This gift was from Lisa, a reader who has become an online friend. Lisa lives in Toronto and we met in the most serendipitous way when she won one of my novels in a giveaway on the Women and Words blog when I guest-blogged a few years ago. She took the time to write me after she’d read the book to tell me how much she enjoyed it. We’ve been e-mail friends ever since. More recently, she’s become a trusted beta reader whose attention to detail astonishes me. She’s a doctoral candidate working on her dissertation, and she’s going to be brilliant in her field. A few days later, I received another gift, this time from a reader and new online friend from London, Lorraine. 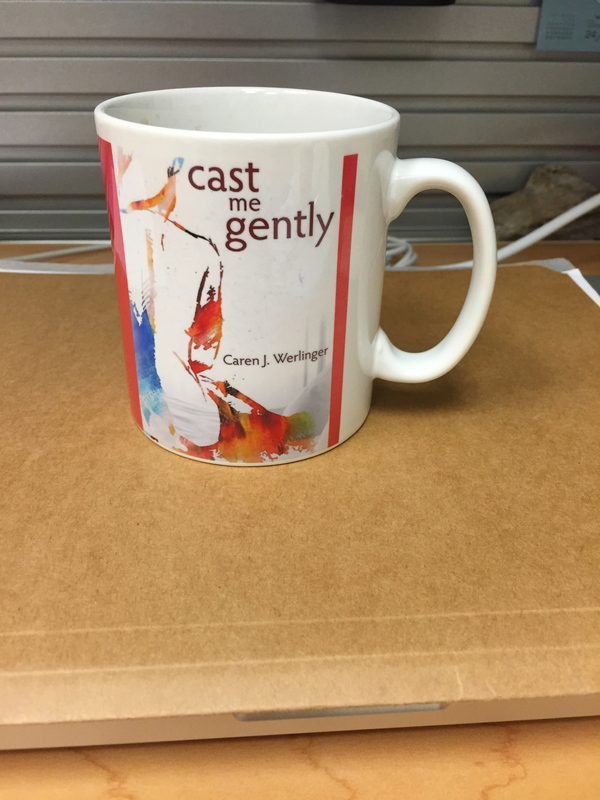 She sent me a pair of mugs with images of my book covers – another incredibly thoughtful gift. I’ve never met either of these women in person, but I hope I will someday. 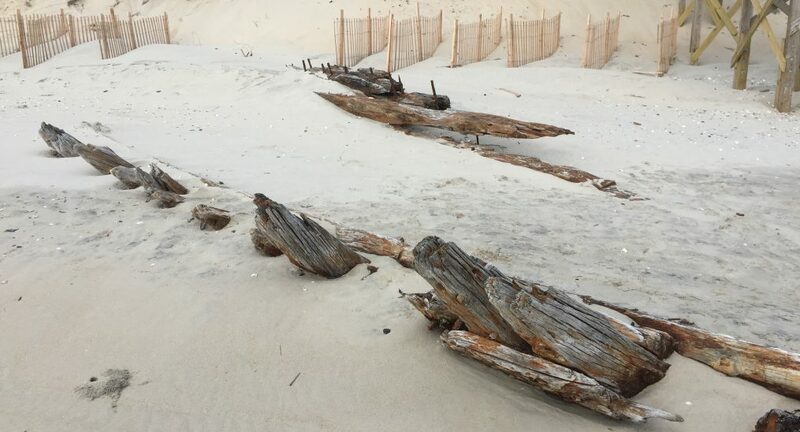 Their gifts reminded me of a few things – that this world has become much smaller and more intimate thanks to the ability to connect across thousands of miles. 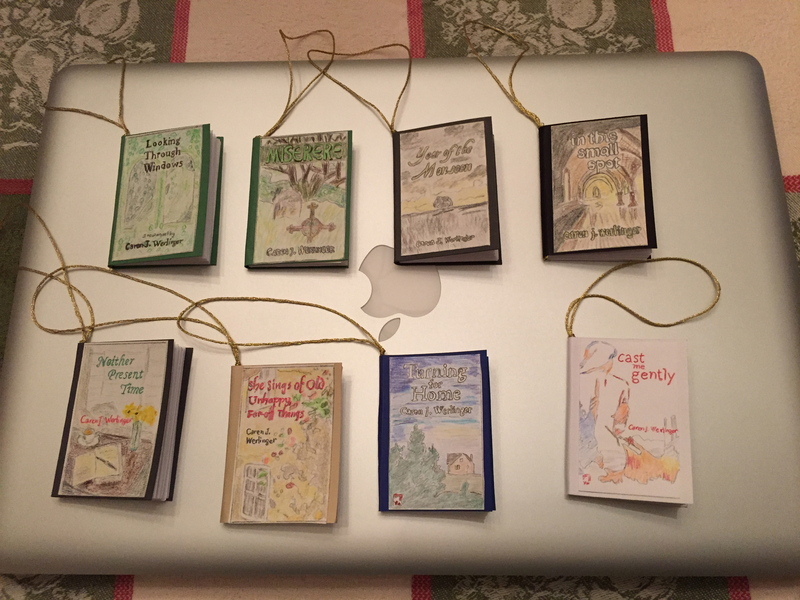 They remind me that for all of us, words still have the power to move people and that I am incredibly blessed that my books have connected with readers in a way that prompts them to think of me so kindly. But I have a feeling they’re just really nice people I’m lucky enough to have crossed paths with. This is a season of introspection anyhow, but these gifts, so unexpected and heartfelt, have prompted more introspection than usual. In a year when our small world of lesbian fiction has lost too many – Sheila Connolly, Cate Culpepper, Nene Adams and Sandra Moran among them – it would be easy to see the world as emptier. Acts of kindness help to fill the void they left – things made and done by small hands – hands that won’t be idle with despair – doing what they can to make the world a better place. I’ve shared a couple of links to more songs I love. Turn the lights down and listen. I hope you enjoy them, too. Wishing you all a peaceful end to 2015, surrounded by friends and family, and a healthy, happy 2016. This entry was tagged Cate Culpepper, Christmas, Jewel, Nene Adams, Sandra Moran, Sarah McLachlan, Sheila Connolly. Bookmark the permalink. The Internet can indeed bring good and sometimes wonderful things into our lives. Like you, I have made friends with readers…and even asked one of them to marry me. One never knows how our words will affect others, or what the kindness of others may lead to. I love that story, Fletcher, how you and Maria met through the Internet. And I love the ripple effect of kindness. Wishing you both a wonderful holiday season. I wish the same to you and yours. Also, I’m still envious of those ornaments. Caren, I am touched by your reaction to my gift. And how sweet of Lorraine to send you the mugs! I am thankful for your friendship and for the honour of beta reading your work, which is so meaningful to me. Your kindness and generosity to others is evident in many ways, such as through your fundraisers for food banks and pets of the homeless. So, somehow, I think I must have wanted to send a little reflection of that back to you. Thank you for sharing the beautiful music videos. I’m glad you liked the music videos, Lisa. I love those songs. And thank you for your other comments, too. I will be posting an update on the Pets of the Homeless fundraiser in the next day or two. They have a certain something, don’t they, Widdershins?